Editor's Note: This is the second part of my adventures of converting to a new phone. The first two parts will cover synchronizing your contacts between my old phone and my new phone. Although I'm using Mac OS X for most of this series, the tool I'm covering in this article works on both Mac OS X and Windows. So, either your first phone isn't supported by iSync, or both. Or perhaps you're a Windows user that's ready to give BitPIM a whirl. Whatever the case, BitPIM is the focus of this article. In the last article, I discussed getting your contacts into your Address book from your phone via iSync. To get these contacts into a format usable by BitPIM, you must export the contacts. It's worth mentioning that any contact information manager including MS Outlook, Mozilla Thunderbird and most of the popular web-mail sites can export your contacts to a vCard file that BitPIM can load onto your phone. Again, if the screen shots aren't legible, click on them to get the full sized image. To get your contacts out of OS X's Address Book, highlight all of your contacts (or only the ones you want to load onto your new phone) and then use the File -> Export -> Export vCard menu. I assume that you've already established a bluetooth or cable connection from your computer to your new phone following the instructions in Part 1. Once that's established, download and install BitPIM. Run it. BitPIM is a bit of a kludgy beast. The UI isn't terribly intuitive. It won't work with all BlueTooth phones. Case and point, my e815 covered in Part 1 doesn't seem to get along very well with BitPIM, and I can't seem to get it to connect. BitPIM works on more phones than iSync, so between iSync and BitPIM you're likely covered. First, get your phone working with BitPIM. Select "Preferences" from the "BitPIM" menu. Try the Phone Wizard, or adjust the settings manually. This isn't too hard. You'll be prompted to merge or replace existing data. If this is the first time you've run BitPIM, you shouldn't need to do much else. Just walk through the prompts and get all your contacts into BitPIM. Now, Click the "Write To Phone" button (Second icon on the upper left, between the "Read From Phone" icon and the Big H "Historical Data" Icon). Select "Contacts" (and Add or Replace as you need) and hit OK. You'll see the progress meter at the bottom scroll a few times, and then when it's done, it will likely restart your phone. You can also sync the BitPIM calendar to various calendars, for example Google Calendar, iCal, or a calendar on another phone. 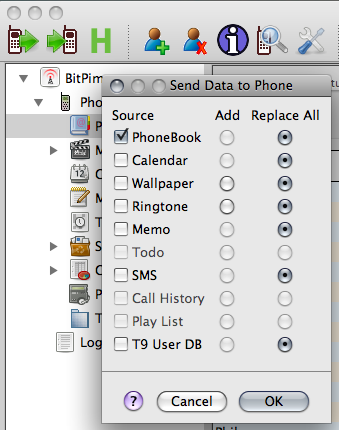 If your new phone supports it, you may be able to grab your calendar data and beam it to your phone easily with BitPIM. The LG Chocolate VX8550's calendar works well with BitPIM, so if you've got one, feel free to give it a shot. BitPIM has a lot of other functionality as well. Play with the Import and Export options in the file menu. 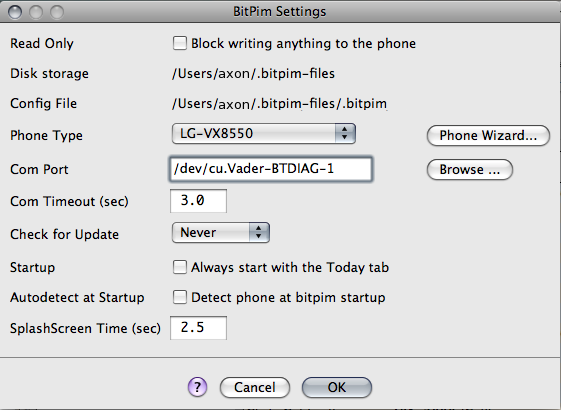 Beware that BitPIM does, in fact, alter your phone's internal data files. There is a possibility that you could brick your phone. All in all, I've had pretty good luck with it so far.